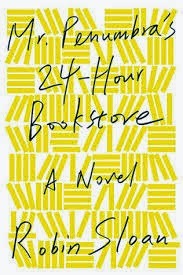 a book chick: "Mr. Penumbra's 24-Hour Bookstore"
my take: Yes! I'm a sucker for bookstore stories. A store lined with books? Yes. Yes. Yes. This is a bit of a mystery -- when the main character gets hired for the overnight shift at the 24 hour bookstore, he notices lots of crazy customers and odd books. As he and his friends try to uncover the weirdness, it's a Davinci Code meets high tech in a quest for the fountain of youth. my source: Snagged off BFF Susan's bookshelf. It's good to have books. It's good to have friends. It's great to have friends with books.